Metastatic breast cancer can also be termed as advanced breast cancer. In medical terms advanced breast cancer can be defined as a breast cancer which has spread beyond the breast to other vital organs in the body like bones, lungs, liver or brain are the few most common ones to name. Mostly, metastatic breast cancer arises months or years after a person has completed treatment for early or locally advanced type of breast cancer i.e. stage I, II or III of breast cancer. Hence metastatic breast cancer is sometimes also called distant recurrence. Globally increasing awareness and development of new therapies and drugs is expected to drive the demand for metastatic cancer industry during the forecast period. Radiation Therapy and Chemotherapy are the most popular therapy used to cure metastatic breast cancer as they help to suppress the growth of the tumor. Hormone therapy is expected to be the most preferred therapy as it helps to restrain the growth of cancer cell. This therapy expected to increase the market share of Metastatic Breast Cancer Market. Geographically North America dominated global metastatic breast cancer market and it is driven by best in the class healthcare infrastructure, advanced facilities, best healthcare practices, increased awareness about breast cancer and higher spending on healthcare by its citizens. North America was followed by Europe and Asia-Pacific as second and third largest market for metastatic breast cancer market. As stated by World Health organization the rate of death by breast cancer is increasing in number and predicted that it will continue to increase in near future. This expected to increase the market share for Metastatic Breast Cancer Industry. Asia Pacific is projected to have fastest growth, owing to rapidly increasing healthcare infrastructure, increasing awareness, increased spending, government initiatives and growing medical tourism industry in developing nations such as China, and India in this region. This report provides depth analysis on the global metastatic breast cancer market size for the year 2014-2016, and forecast of the same for year 2021. 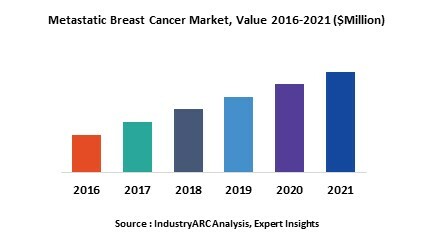 This report also incorporates with metastatic cancer market outlook, market drivers, restraints, growth indicators, market trends, challenges, and other key aspects with respect to global metastatic breast cancer market. This report also imparts an outlook on market prices, market revenue, market worth, and market value of Metastatic Breast Cancer Market. 14.8. Aslan Pharmaceuticals Pte. Ltd.